DIE Mercurii, 9 die Januarii. Message to H. C. for a Conference on the Coinage Bill; with Grosvenor's Bill;-- and about L. Strangford's and the E. of Cleveland's Bills. Edwardus Comes Manchester Camerarius Hospitii. Hodie 2a vice lecta est Billa, "An Act for making Provisions for such Places and Persons as shall be infected with the Plague." Their Lordships, or any Seven; to meet on Monday next, at Three of the Clock in the Afternoon, in the Prince's Lodgings. And it is recommended to the said Committee, to take Care of the Privileges of the Peers. 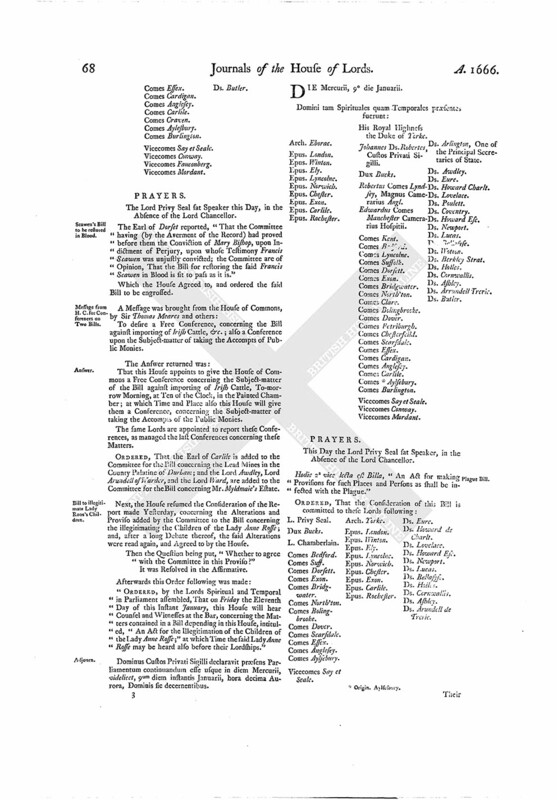 To desire a Conference, by a Committee of both Houses, presently after the Free Conference and the Conference already appointed for this Morning, concerning the Bill for encouraging of Coinage. 2. To deliver to them the Bill for selling the Lands of Leycester Grosvenor, and desire the Concurrence of the Commons therein. 3. 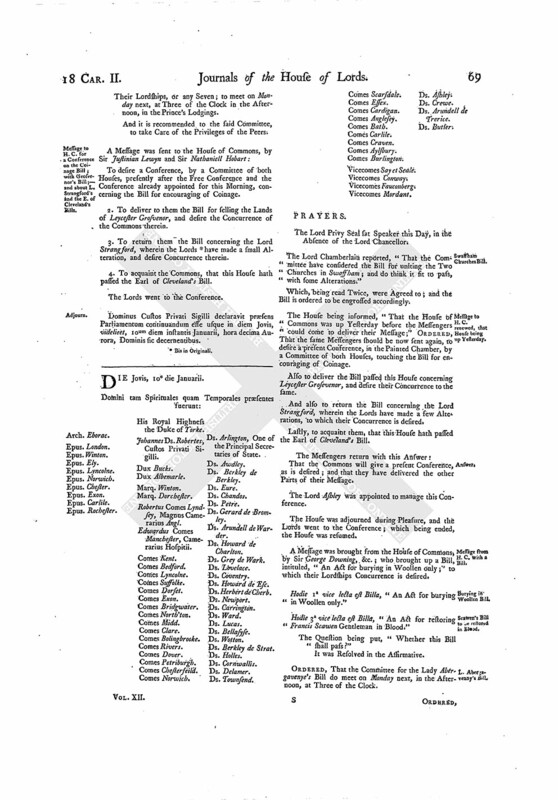 To return them the Bill concerning the Lord Strangford, wherein the Lords (fn. 2) have made a small Alteration, and desire Concurrence therein. 4. To acquaint the Commons, that this House hath passed the Earl of Cleveland's Bill. Dominus Custos Privati Sigilli declaravit præsens Parliamentum continuandum esse usque in diem Jovis, videlicet, 10um diem instantis Januarii, hora decima Aurora, Dominis sic decernentibus.